Clarets boss Sean Dyche admits he could “taste it in the air” that Dwight McNeil was ready for first team action. The 19-year-old has started the last six games, and last week signed a new contract until the summer of 2023. He returns to Old Trafford to face Manchester United – who released him as a 14-year-old – tonight, with praise ringing in his ears from Dyche, after his display in Saturday’s FA Cup defeat at Manchester City. 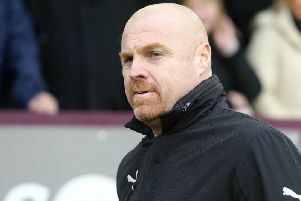 And Dyche isn’t surprised by how he has adapted to regular first team football: “The only thing that’s surprised me, there isn’t that magic moment where you know for a fact they’re going to do it, but there are players who you just smell it on, like him, where I thought ‘you’re ready’, and I’m beginning to taste it in the air when I’m around him. “I’ve been around enough footballers to have an instinct when they’ve got a feeling about it, to be ready. “Your staff are very important, ‘are you seeing what I’m seeing?’ But it’s my decision, and that was to put him in at that time, and he’s done nicely. Burnley acted quickly to extend his contract, and Dyche feels it was very much deserved: “I think he’s earned it, he’s done very well. “When I felt it was appropriate, I put him in.